Would you like to win a free WaterSafe City Water Test Kit? If so, then enter below! The Water Test Kit Store would like to give away a WaterSafe City Water Test Kit in the next few days, so here’s your chance to win! If already following us on Twitter and Pinterest, don’t worry! Simply use that option and you will still get entered BUT you still must use the ‘official’ Rafflecopter entry process for all applicable options to be entered in the drawing for the FREE WaterSafe City Water Test Kit. That’s it! You’re entered! Good luck and don’t forget to come back each day and earn additional entries by tweeting about the drawing! We will announce the winner in the week of April 6th, 2015. Win a WaterSafe City Water Test Kit! ANOTHER WaterSafe City Water Test Kit Valued at $23! That’s it! You’re entered! Good luck and don’t forget to come back each day and earn additional entries by tweeting about the drawing! Free WaterSafe City Water Test Kit? WaterSafe City Water Test Kit Valued at $23! Congratulation Jennifer K! You are November’s Water Test Kit Winner! We would like to congratulate Jennifer K for winning the WaterSafe Science Project Water Test Kit (4-Pack) that we gave away last month! We hope a student will learn a lot using the kit and get a great grade on their science project! 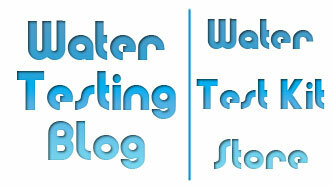 December’s Water Test Kit Giveaway is… a WaterSafe City Water Test Kit Valued at $23! Many people take for granted that safe, clean drinking water will flow from their faucets... but how many of us have ever taken just a few minutes to think about how MUCH water flows from our faucets each day or swirls down and out of our toilets each time we flush? The largest (residential) use for water has nothing to do with cooking or even drinking. We use more water to wash our cars, water the lawn, water our plants, and wash our pets! When shaving with a razor, the average person uses roughly 2 gallons of water during the process. When a leaky faucet has a d rip rate of roughly one drip per second, in a year that faucet leaks a total of about 3,000 gallons. On average, the normal citizen uses about 100 gallons of water in everyday life. No matter how we look at it, water will one day become one of the most widely sought after substances on the planet so we all need to take positive steps toward conserving the safe, clean water we have left and developing new technologies that will help us clean up 'gray' water and improve efforts to conserve water in all aspects of our lives. Inaccurate lead in city water tests in the Windy City? According to a new EPA study, yes, the manner in which city workers, homeowners, business owners, and private groups that monitor water quality may have yielded less than accurate results. So… How did the older methodology of testing for dissolved lead in city water (all over the US and not just in Chicago!) fail? Quite simply, the old testing method focused primarily on the plumbing leading from the water connection at the water main out to the faucet… and disregarded the possibility that older service lines contained in an area’s infrastructure may contain lead components. Residences constructed before 1986 more than likely have lead service lines between the building and the water main. Some homes may have copper piping joined together using solder that contains lead. Some brass faucets may contain trace amounts of lead that could leach into the water over time. Work done to repair damaged, older water mains will sometimes result in higher than normal amounts of lead finding its way into drinking water. As a general rule health officials and water quality professionals all agree that lead in drinking water causes health problems — especially in the young and the very old. Can the average person test for lead? Of course! 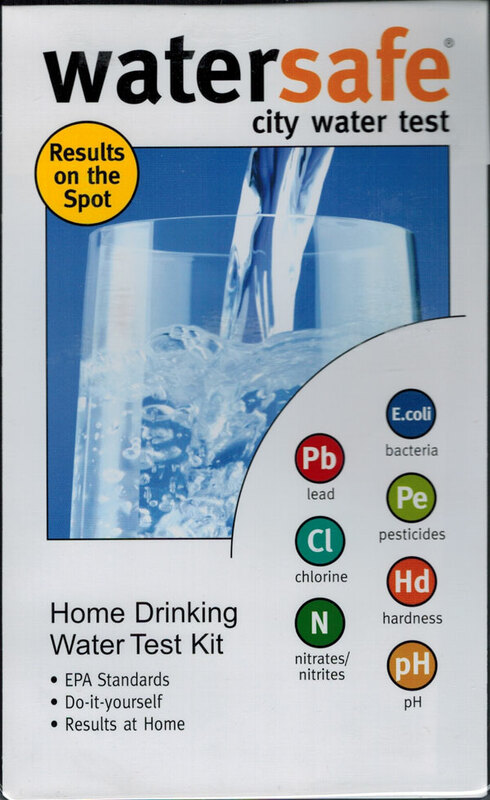 WaterSafe manufactures an easy-to-use lead in water test kit that lets a person know if their water sample contains 15ppb or more dissolved lead. Why 15ppb dissolved lead? The USEPA set the MCL (maximum contaminant level) for lead in its Primary Drinking Water Standards at 15ppb, meaning if a public water supply contains 15ppb (or more) of dissolved lead, the water treatment facility must take immediate action to correct the situation. For additional information on lead in water, we suggest taking a look at the lead in drinking water information page on the USEPA web site. Today we read an article discussing how the President’s wife, Michelle Obama, encourages people, as part of a healthy lifestyle, to drink more water. For several years now Michelle has encouraged Americans to make better dietary choices and get their lazy butts off the sofa. Why? Because she believes both of those lifestyle changes will help the population combat not only obesity in general, but more specifically childhood obesity. On average the American adult drinks far less water than the 8 glasses a day (64 ounces) suggested by experts in the medical profession. Even worse, children and teens tend to drink even LESS water than adults — and that’s NOT a good thing! By simply substituting one glass of water for another beverage each day some health experts believe a person will begin to feel better and could start to show a bit of weight loss over time. We definitely think the American population, as a whole, needs to shed a few pounds and do a bit more exercising… and we include ourselves in that population, by the way. For our own hydration needs we take the time to make sure the water we drink will not only meet our hydration needs, but also not add unwanted pollutants to our bloodstream, not add a lot of unnecessary expense to our budget, and not add a bunch of plastic containers to the recycling bin at the end of the day. City/Tap Water: Test your tap water for quality and make any needed adjustments to quality and/or taste with the appropriate water treatment system. Tap water will serve as your most convenient and least expensive source of drinking water in the long run. Well Water: Should the aquifer from which your well pulls its water become contaminated, no one will come out and tell you about the water quality problem because responsibility for the quality of the water your well produces belongs to you. Periodic testing allows you to know for sure that your well water contains no harmful contaminants and that means your well water will serve as your most convenient and least expensive source of drinking water. Reusable Water Bottles: Yes, a lot of water bottles these days get made from plastic, but if reused over and over again the footprint left in landfills becomes a mute point. One can also look into using glass water containers and portable metal water containers, as well. 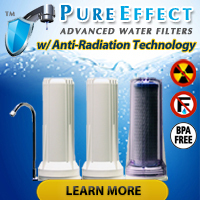 Bottleless Water Coolers: If you would like the convenience of filtered water at home or in an office setting and don’t want to install a water filtration system or deal with heavy 5-gallon water jugs, then you may want to consider bottleless water coolers as an option. You can even get one that has a hot water tap so you can have instant hot water for a cup of tea or cocoa! An article in yesterday’s State Newspaper (one of the newspapers covering events in and around Columbia, SC) discussed a recent decision by the residents of Timmonsville, SC to turn over control of their dilapidated sewer and water system to neighboring Florence, SC, a town with more than ten times the number of residents and a better budget for infrastructure repairs. With only around 3,000 residents in its tax base, Timmonsville simply could not seem to keep in line with EPA mandated regulations concerning water quality and functionality of its sewer lines. As examples, the federal government recently sued Timmonsville for failing to adequately chlorinate its public water supply and for the collapsing of a sewer line that resulted in raw sewage backing up into buildings in the downtown area. Obviously both raw sewage and improperly treated drinking water can make a person ill — but, again, with such a small tax base, the town simply could not afford to make things right. Just a few short years ago the EPA reduced the allowable dissolved arsenic concentration in drinking water to 10ppb and many smaller communities that had issues with arsenic in their water supply clamored that they could not currently — or in the foreseeable future — afford to install the equipment needed to bring their arsenic levels down under 10ppb. Naturally the government set up special programs (i.e. arranged for funding & gave extensions for compliance) for communities facing non-compliance with the new arsenic in drinking water regulations but sometimes we wonder just how many small towns (like Timmonsville, SC) still have not managed to get their water quality issues under control. Just so that no one accuses us of saying only small communities have troubles keeping their water and sewer lines in order, the same article also mentioned how Columbia, SC, a MUCH larger city than Timmonsville, SC, recently reached an agreement with the federal government that will require Columbia to make an estimated $750M dollars in repairs to its sewer lines in the near future. Whether you live in a small town on the backside a grassy hill surrounded by lush fields of wild grass or you reside in the heart of thriving metropolitan area with scarcely a tree in sight, water problems can pop up without warning and most certainly without mercy. Let’s face it: City and town governments have artfully avoided dealing with ailing sewer and water lines for many years (aka: elected officials shy away from important issues that would hint at a possible [probable!] tax hike… so they can get re-elected) and now many regions all across the United States find themselves teetering on the brink of infrastructure collapse. Bonus round: Throw in a bit of ‘sequestration’ (just to spice things up) and now even LESS money exists in city/town budgets and coffers to make necessary sewer and water line improvements. At the beginning, middle, and end of the day responsibility for the quality of the water we use in our home rests in our hands… so we will continue testing our drinking water periodically and using appropriate water filters to handle any ‘problems’ we detect. It’s our water, our health, and ultimately… our LIFE!